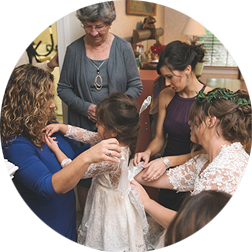 It only seems appropriate to offer a furnished, two-bedroom/ two-bathroom guest house for the bride and her girls to get ready in for the big day when your venue is on a farm. This section of the horse pasture was converted into a 10,000 sq ft display of various herbs and flowers. The stunning ironwork, lighted pergola, and water fountain centerpiece make this a magical garden and a unique location available for ceremonies or cocktail hours. 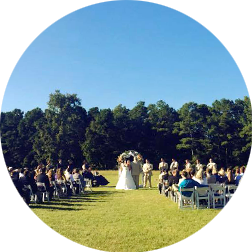 To help complete your dream of a rustic wedding, we have a stunning wide-open, 20-acre pasture available for ceremonies. A setting sun over an endless view of rolling pasture creates a perfect backdrop for your wedding. 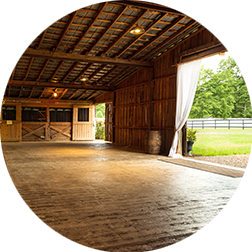 The 20-stall horse barn, originally equipped with an indoor riding ring, is the perfect spot for a Rustic wedding of your dreams. The 40 year-old original barn wood, mason jar pendant lights, curly willow entangled with twinkling lights, and breath taking view of the pond are just a few of the features that combine for a romantic setting. When friends began to ask if they could use our barn for their wedding ceremony, the idea to use our beautiful property as a wedding venue just took off. What began as a passion for gardening, has now transformed into a truly unique and magical setting for your special day. The beauty of choosing our venue is the endless possibility. Many happy brides have used our venue, but each wedding has been a distinctly unique take on our farm as seen through each bride’s eyes. 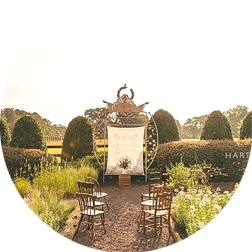 So, if your wedding day dream includes a rustic barn, a green pasture, tranquil pond and lush, fragrant gardens, then come visit The barn & gardens of The Little Herb House. We will be happy to give you a tour of the farm, show you around the barn, introduce you to the cows and chickens, and turn your dream into a reality! Give us a call today to schedule your visit. It begins with a phone call or a quick message to schedule an appointment. Let us help you tell your story.